Aw hell yeah, that's neeto. The description makes me think Command Mission? Anyone else??? With the Whole X-Boost being a temporary form. And in Command Mission Hyper Form armor (X-Fire MMX) only lasted a few rounds before reverting to base Mega Man X. On the other hand, Good play Tru-Force XD I had no intention of spending extra moneys this month or well to much extra money the next couple of months really... But this albeit not a true redesign but a color-swap looks cool and as a backer with the chance to buy it I'm taking it! Still seems strange that Big Bad Toy Store had this up for sale for $150 before backers got their chance at a $90 one. I debated getting it... but I was only going to immediately flip it if I did. And since I'd only be getting $60 max, it's not worth the effort. Hope those that get it love it though. I love my X-Kai and this one looks equally as cool. They probably bought theirs at comiccon. All kinds of comiccon exclusive products appear on the toy sites, all the time. Just because they came out with a variant, does not mean they owe the backers anything. 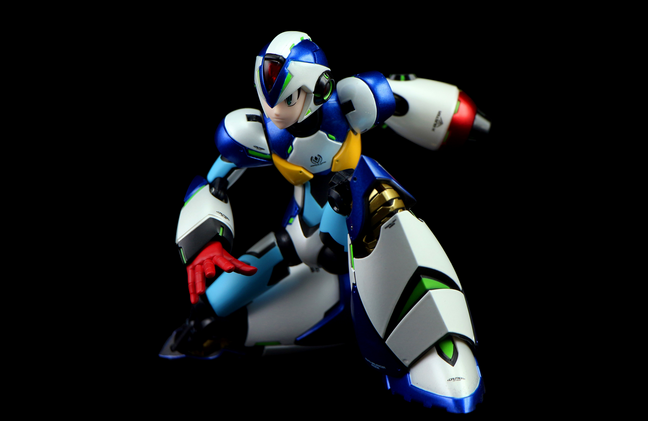 They promised backers the original figure and the prototype X. The comiccon discount other offers, post events in both cases, are just nice bonuses on their part, and I appreciate it. They did not have to offer post kickstarter product to the backers at all. Sure! You'll probably get about half off the MSRP. There's likely no backer who isn't going to price-gouge the hell out of their exclusive collector's figurine. Before this, the X-Kai was going for $200 after market, and that's the only one I really want. This one looks nice, but it's not really doing much else for me. "X-Boost" mode? No thanks, I'll wait for the Giga Armor mold. Ordered one. I like this design. It's pretty cool. The red/black hands reminds me of the X4 Armor arm part option. They did say in a comment thread, on their facebook I think, that this is the last recolor of this mold and they are trying to hammer out the licensing for their next figure. I wonder if it's the ride chaser or something else. $160 compared to $500. Are they seriously trying to sell it for reseller prices? While I don't think anyone would realistically buy or sell these for $500: the X-Kai figure (for example) can be had from anywhere between $220 and $400 right now, and the "Backer Variant" is (if you can find one) steady at $400; $500 isn't far off, and Truforce isn't making more of them. For now: all the Truforce color variants have only increased in value, though who knows if they will hold on to that inflated value; they're all still fairly new, and interest is still high. I think Truforce is selling the X-Boost figure directly for $500 so that they can have more control over their inventory and where the figures are sold, as so few people (if any) will buy it at the $500 price point. The high price point discourages non-backers and people who did not attend the SDCC from buying the figure, while simultaneously enhancing the feeling of exclusivity for backers and SDCC attendees who did purchase the figure. where are you getting these numbers from? Here is the sold listings, they aren't going for much over 100 with an out of the box one selling for 15 dollars a while ago. They are trying desperately to put a value of 500 on this when the market is dictating that their products are no where near that. The backers received a code to knock the price from 500 to 90. As mentioned above, the 500 default price discourages non backers who did not receive the promotion code for a discount.